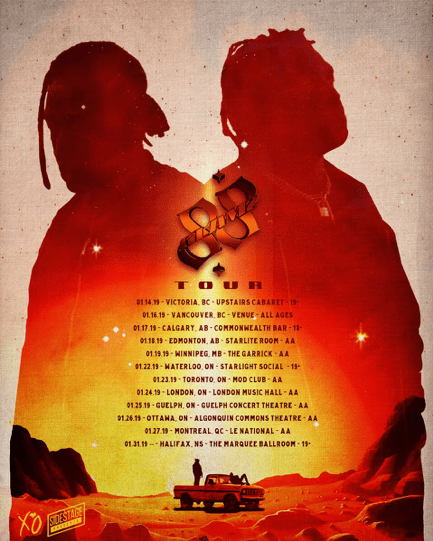 10 December 2018 (Toronto, ON) – Canadian Hip Hop duo 88GLAM announce their first headlining Canadian Tour today. Following the release of their second album titled 88GLAM2 the duo will kick off their headlining tour in Ontario on January 11th. 88GLAM will make a total of thirteen stops across the country wrapping the tour back in Ontario on the 31st of January. Full tour dates listed below. 88GLAM, comprised of Derek Wise and 88 Camino, signed with XO records (The Weeknd, Belly, NAV) earlier this year. Upon signing 88GLAM re-released their self-titled album 88GLAM: Reloaded. 88GLAM: Reloaded expanded the original track listing with three brand new songs, including “Celebrity Crush,” “On Sight,” and “Twin Turbo.” Additional standout tracks included the hit “Bali” with a surprise feature from NAV and 2Chainz and the Billboard-premiered “12” whose music video features a cameo from The Weeknd. Additionally, it boasts production from Murda Beatz, WondaGurl, AlexOnWeed, and VillaBeatz.